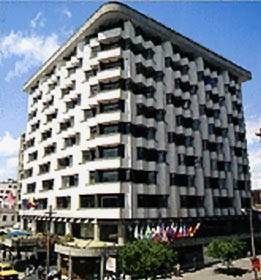 The Alameda Real Hotel enjoys a perfect location between the historic district and the modern financial area of Quito, yet it is only 20 minutes to the international airport. The lobby is open, atrium-style with a coffee shop and an inviting fountain, and a cozy cocktail lounge tucked away. There is also a formal dining room and casino. The Alameda Real features 150 attractively decorated, spacious rooms on ten floors, all equipped with complete bathrooms, air-conditioning, minibar, safe, direct-dial international telephone, 110 volts A.C., and cable television. Hotel amenities include two restaurants, three bars, 24-hour room service, laundry service, boutiques, business center, fitness room and seven banquet halls.